Earth’s magnetosphere acts as a protective shield, absorbing and deflecting plasma from the solar wind. These interactions between the magnetosphere and the solar wind create the auroras we observe at the poles. About 50 years ago charged particles coming mainly from the Sun were detected in the inner regions of the magnetosphere. These particles are held in place, creating usually two belts named Van Allen radiation belts. When the Sun, though, presents high activity a third, transient belt is created. Since their discovery, a complete explanation of the dynamics of the Van Allen belts remains elusive. In particular, the current theoretical model fails to reproduce the third belt. Now, astronomers with the participation of adjunct researchers of the National Observatory of Athens have published a new study in Nature offering a plausible explanation for the formation of this enigmatic third belt. Based on their analysis, extremely fast forward ultra-low-frequency (ULF) wave transports establish the third radiation belt, without the need for high-frequency wave-particle loss into the atmosphere. 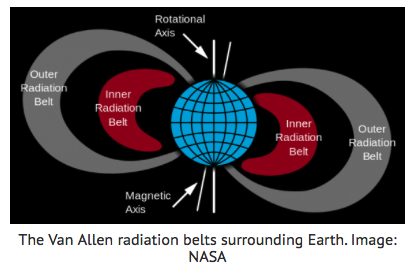 Understanding the exact mechanism that forms the Van Allen belts is of great importance as this space radiation puts at risk our satellites and power grids. What causes the rhythmic pulses of the X-ray light emitted from black holes?